I have loved glass ever since I can remember. The way the light comes through it from a full moon to the slightest reflections, has always been intriguing to me. And color. Layers of color. I cannot live without it. When all these things come together, it truly has an effect on me that fuels my passion for this medium. My ideas are always evolving and, having started my art doing stained glass in the traditional form, I quickly became tired of that as I always try to look at my artwork in different ways. 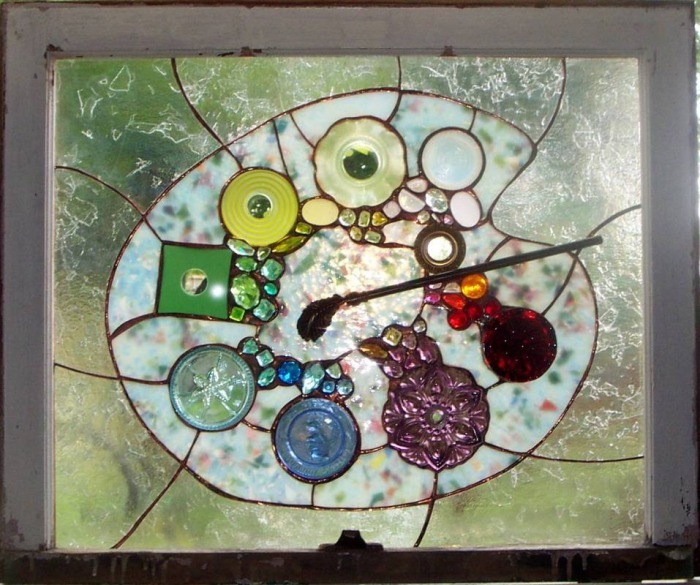 This is an advanced form of stained glass, where I use antique/vintage glass inclusions in each piece. All individually foiled and soldered with classic stained glass as the background. I also recycle old window sashes to use as my frames. On the page tabbed "Current Artwork", you will find my pieces that are currently available. I also, a various times, have smaller, copper framed pieces (not in window frames) that are not listed there but available for purchase. Please contact me at: artthree@att.net any questions. Please check my "Show Schedule" tab to view my artwork at an upcoming art show. It is also possible to come to my home to view and purchase any current artwork I have available. Just drop an email to me!